After the meal at Italiannie’s, we walked a few rounds, before my sweet tooth started aching (no, not aching cz of the dessert, but rather, aching for attention … haha). 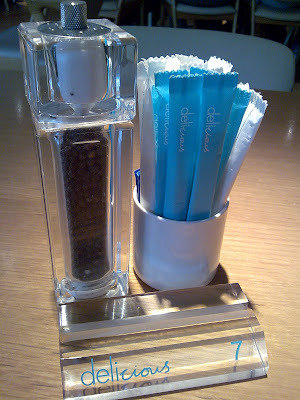 We reached Bakerzin, but as much as I would like to step in and try their desserts, they seemed a bit too petite la. One gobble and all gone. Hehe … ‘Hey, what’s that a few doors away?’ Haha, The 1st time i came for desserts, this shop did not disappoint. Erm, the food didn’t, but the service surely did. Wow, look at THAT! 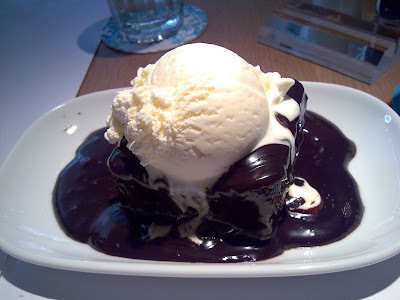 Lots of chocolate sauce, and warm chocolate cake underneath the cold vanilla ice cream! All melting away …. aaahhh …. my heart as well. Hehe. Might be a little bit too sweet for some, plus the ice cream was quite cold, sure to tingle the nerves of your tooth. 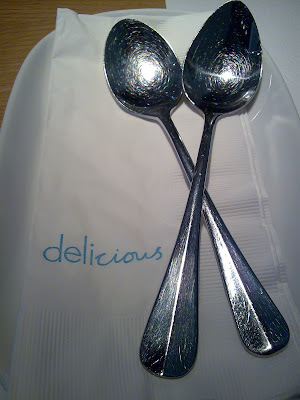 =P But reli reli sinfully rich, and perfect for those sweet cravings. At RM11.90, consider a worthy contender of favourite dessert joint! Their brownie is sinfully good but the portion seem smaller nowadays. wmw : Oh reli? I think you’ve just found the same adoring fan here like you! szemin : eh, my hp not promoted as camera phone la, Sony Ericsson popular for camera phones. Mine is Nokia 5610 Xpress Music. 3.2 megapixels only. But takes not bad photos cz got Auto-Focus. But at nite, it fails, terribly. I also wanna buy camera la. Argh! I Stole your pic n put it on my blog!!! Sry i cudnt help it! Hope you dont mind! Was overcome by emotion when i saw the pic.. sniff sniff.. Had to blog about all the love that was welling up inside of me before i exploded!! hehheh.. i linked ur blog to the pic.. but say the word n i’ll take it down aight..
allyssa : haha, its ok. not copyright protected anyway. but my photos tend to be slightly blurry as I’m using a phone camera.